How Often Do You Use a Metronome? One piece of advice that you will likely hear fairly often is that it’s important to use a metronome when you practice guitar. When exactly should you use a metronome? How often should you be using it? Which of these is the best advice to follow? There’s no real basis for such strict advice. Although using a metronome has many advantages, and most guitar learners don’t use a metronome often enough, there are also some drawbacks. In performance, especially of solo guitar, time does not need to be as rigid as the metronome; the music can naturally change speed slightly. It does not seem productive to use a metronome when doing slow work of learning technique fundamentals. The best time for using a metronome is when you’re working on your rhythm or speed. You should also consider using the metronome while you practice your repertoire, at least some of the time. This is sound advice. One could make the argument that, unless there is a metronome active, we are not genuinely working on our time. Without the metronome, there is no telling whether we played the rhythm accurately or not. So try to have the discipline to turn on the metronome before strumming some chords or playing an accompaniment or other “fixed” guitar part. While the metronome is an important part of any learning program, it is not necessarily the most important part of acquiring new techniques. Most students learn a new technique very slowly. A clicking metronome, even at a low speed, may be distracting. Once the technique has been thoroughly learned, it’s useful to practice with a metronome. But even then, the metronome can turn the technique into a race. Don’t forget it’s important to go back to that painfully slow practice now and again. This is pretty fair. After all, if you can’t measure the speed that you last played it at, how do you know you’re faster this time? First, play the example without a metronome. Imagine the speed of the beat. You can use the “tap” function that is built in on units such as the Tempo by Frozen Ape[? ]Affiliate Link to determine the exact tempo you have in mind, such as 90 BPM. You may find that you suddenly can’t play the example correctly when the metronome is on! That’s okay, just lower the speed by 10 BPM and try again— and repeat as needed until you’re playing along smoothly. Slowly work your way back up to the original beat, in increments of 2 or 5, depending on the example. The metronome is not merely a tool for increasing speed. You can do that on your own without any help. The metronome is a tool for increasing your standard of rhythmic accuracy. First shoot for being 95% lined up with the beat, then 99% and then 99.99%. It is also a tool for increasing the consistency of your accurate rhythms. If you hit four beats accurately in a row, is that just luck or is that something you can consistently do? Use the metronome to ask more of yourself as a musician. Tempo by Frozen Ape[? ]Affiliate Link, a quality metronome app for iPhone. Seiko Metronome[? ]Affiliate Link, a reliable physical metronome with tap function. Wittner Wooden Metronome[? ]Affiliate Link, an attractive (and pricey!) 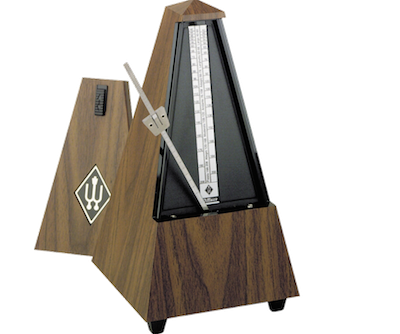 metronome to decorate your studio or practice room. Soundbrenner Pulse[? ]Affiliate Link — an amazing, wearable metronome that uses vibration instead of sound. Not recommended for beginners. If you’re not using a metronome at least some of the time, something’s definitely wrong. If you’re not doing work with a metronome to build your rhythm, you’re going to have problems playing with other musicians and everything you play will likely sound a little weak. The role the metronome plays in your own practice routine is for you to decide. It comes down to how good you want your time to be. Unlike some other aspects of musical performance, time is precision. The more you practice with the metronome, the more precise your time will be. It’s unlikely that you will ever regret practicing with the metronome too much. Every minute spent with it will improve your time and help your playing overall. You should probably shoot for using a metronome (or backing track) during just about every practice session.